St. Andrew's from the Outside. of just 23 Ryburgh men. Nelson………..and that is the real Ryburgh connection. church. 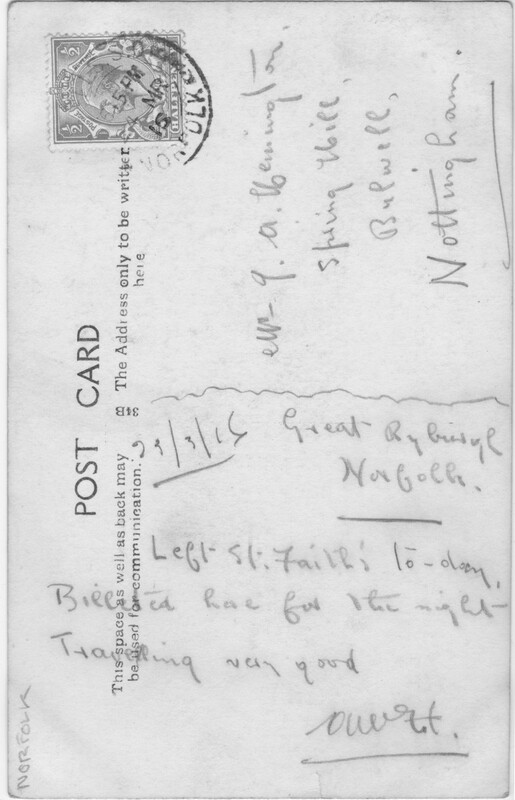 Curiously, the other 1915 card promises to next time send just such a Ryburgh image! sent by some one else according to a brief note at the top of the card! a pair of double doors with a plain coloured, diamond-quarried, glass panel filling the arch above. Ryburgh Church interiors published by Jarrolds. Who knows what will turn up in 2017! Having just marked the death of Ryburgh's 13th serviceman to die in WW1 and begun to realise that next year we will be remembering as many and more again, another new name has to be added to the list. On July 19th Arthur William Allison was the focus of the day and of the ringing of a fine peal by members of the Oxford Diocesan Guild. It was following this that we were contacted by David Walker a great nephew of Arthur Allison who told us that not only had Arthur's brothers all served in WW1 but that his older brother Thomas Henry Allison was also killed on April 23rd 1917, the same day as Percy Neale and William John Hall. We now know that Thomas and Percy Neale were in the same Regiment and died in the same place, in the same battle and who knows possibly in the same company and platoon? Percy is on all our War Memorials and Thomas seems to be on no local memorials at all. Arthur is remembered in Fakenham where the family were living but not Thomas. 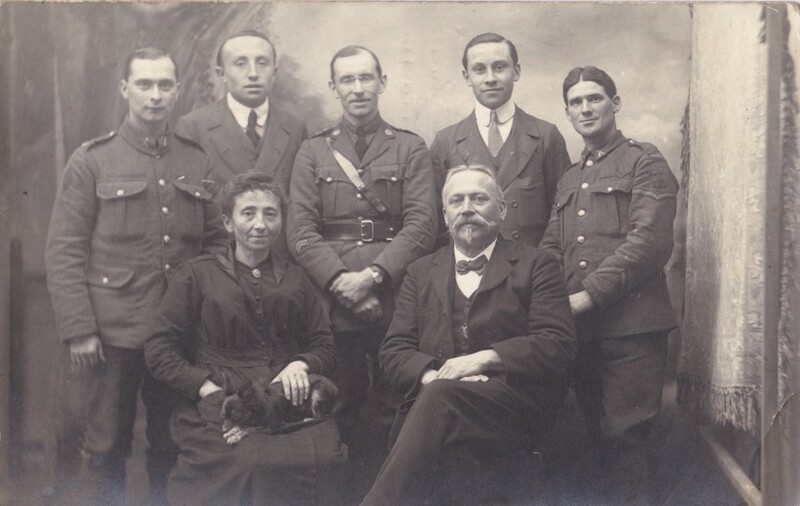 He had married Margaret May Colman from Briningham in the 3rd quarter of 1915, presumably when on leave, as he had first been posted to France at the end of March earlier that year. Where and how they met is not yet known although in 1911, Margaret and her older sister Maria were both in service together in Wimbledon, she as a cook and her sister as parlour maid, whilst Thomas was still living in Fakenham and working as a groom. As his widow and sole legatee, Margaret received an initial payment of £6-14/-4d in August 1917 and a further £15 War Gratuity in 1919. We currently know nothing further of Margaret except that a Margaret May Allison married Abijah Grand, a Railway Fireman from Melton Constable in 1919 and emigrated with him to Australia. She died there in New South Wales in 1972. Thomas and Arthur Allison were just 2 of the 11 children born to Thomas and Elizabeth Allison. 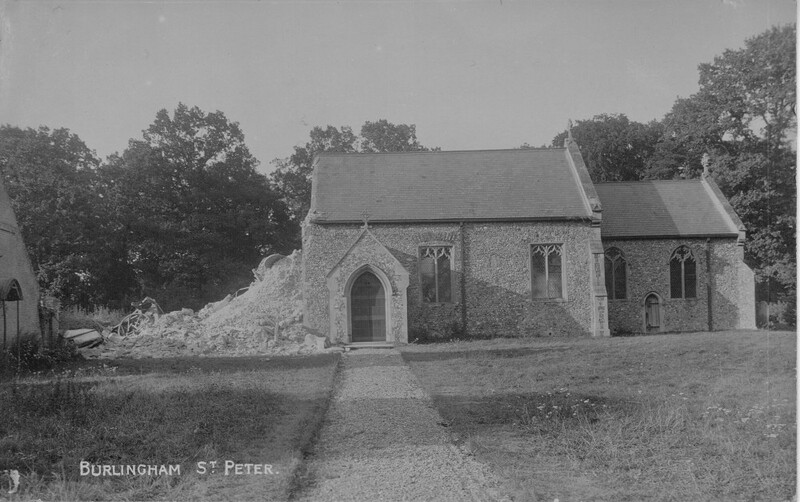 With the exception of the their first born, all the children were baptised at St Andrew's whether they were living in Stibbard Little Ryburgh, Great Ryburgh or Fakenham as had their father before them. Clearly they thought of Ryburgh as home and it is fitting that we are able to remember them. If any readers have any further information about their brothers, especially Phillip John Allison who was a fruiterer in Fakenham and died in 1954, we would be pleased to hear from them. November 2nd sees the 100th anniversary of the death of Everard Barnard Hipkin of Testerton and was, as far as we know, the last of Ryburgh's soldiers to die in 1916. There will be a commemorative peal starting at 2.pm and if you have any connection to or information about Everard Hipkin and his family please let us know and better still pop in to the church on the afternoon of November 2nd. 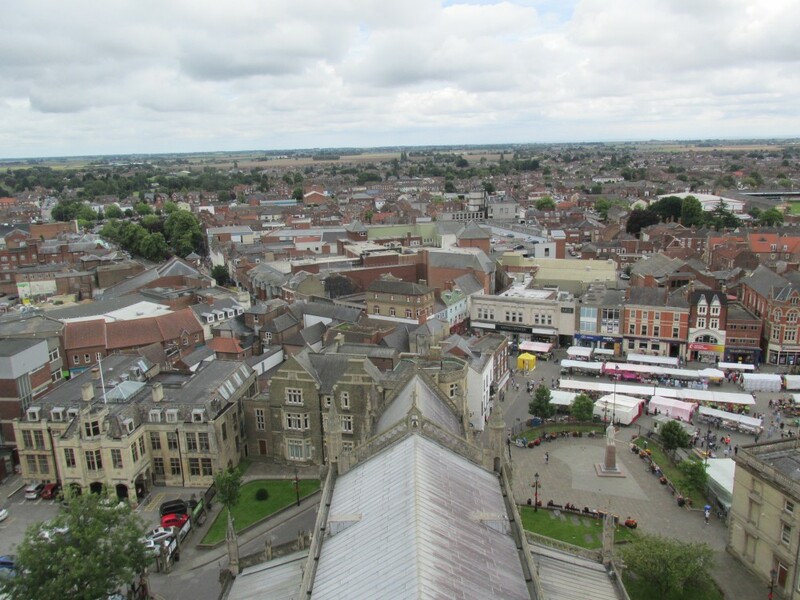 On the ringing front, you may have seen on the national news about the sacking of York Minster's entire bell team including Alice Longden as she was known when she learned to ring at Ryburgh. All ringing has been suspended until Easter by which time the Minster authorities seem to think a new band will have been appointed and trained . Alice started an online petition to allow the sacked ringers to ring for Remembrance Sunday and Christmas. As I write it already has 15,000 signatures. Good for Alice say I and deep shame on York Minster politics. There are underlying issues but this cannot be the best way to handle them. They clearly have no real idea of what goes on up and down the country to train ringers, some of whom, like Alice, will one day be privileged enough to ring the bells of such towers as theirs. can hear a short extract on the Audio page of this website. start of the Think and Thank project and has been very appreciative of our researches. century) who enthusiastically cut the grass each week. indeed fortunate to have such quiet dedication and vitality in our community. 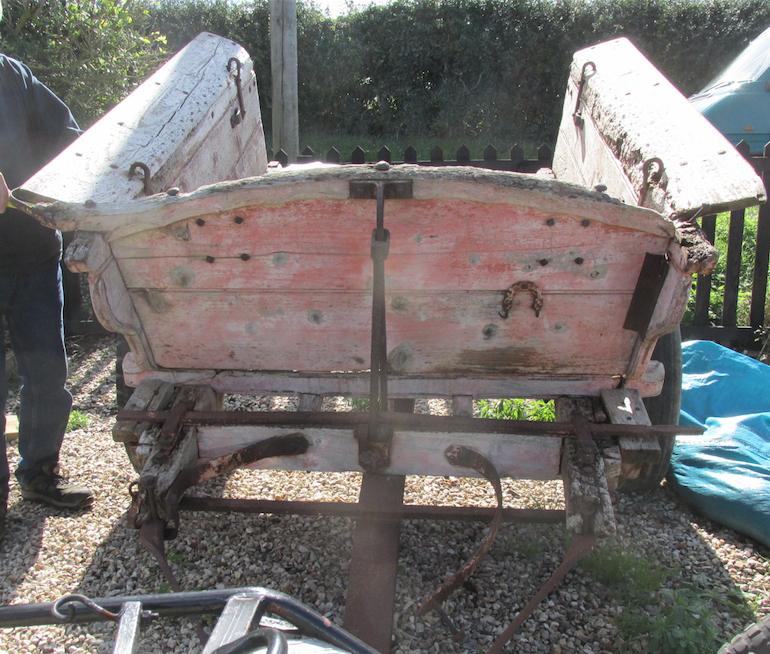 just started to fit the sides so it really does begin to look like a cart again! suppose the next thing is to find a suitable tractor to pull it! 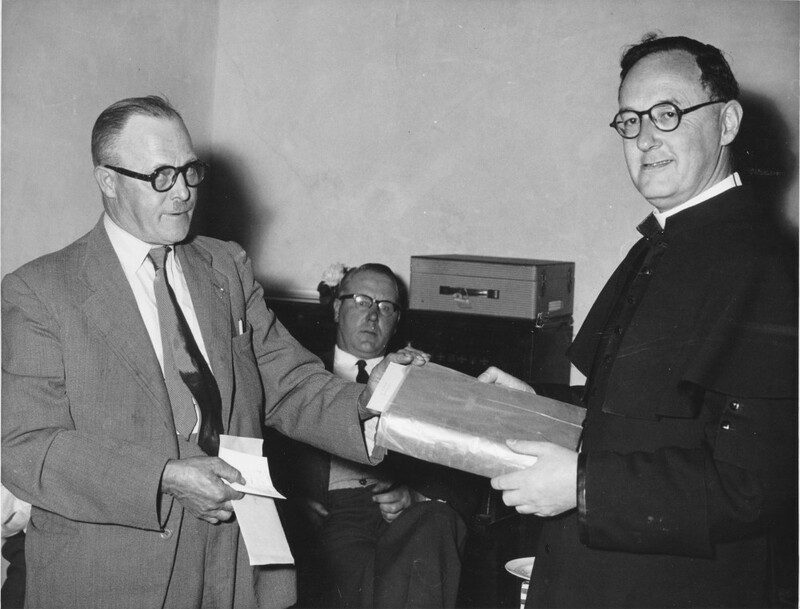 Inspector for Schools in the place of Revd. 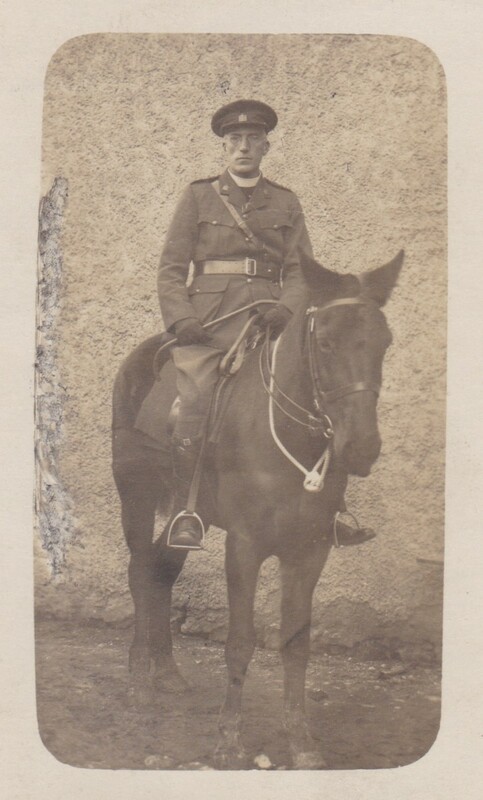 Arthur Robertson Hoare at Colkirk. served as Chaplains. They included Anne Prentis' maternal grandfather, Revd. gives an explanation of who's who. purchased from another officer who was returning to England. 1919. Throughout this period he kept a diary and corresponded with his family. completed by Roger's mother after he died. and so hope to report more fully in the future. year and which is still undergoing restoration. 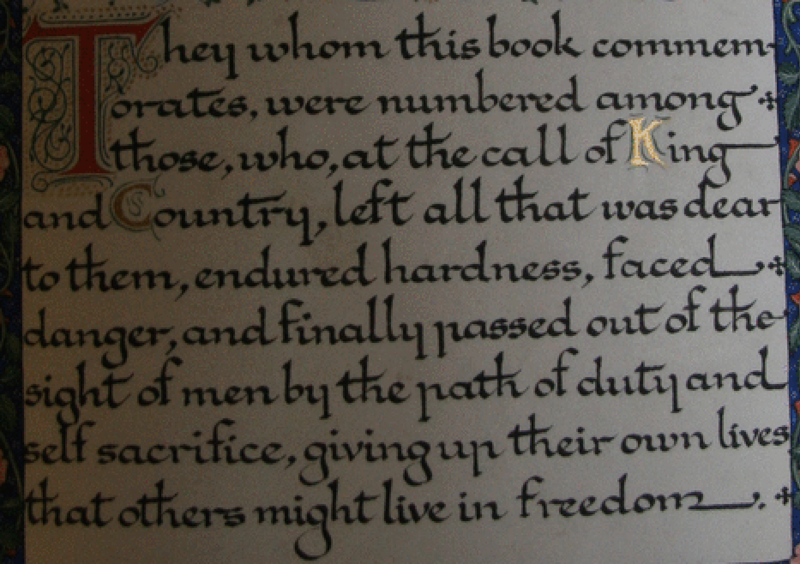 Bell Ringers and is particularly pertinent to our Memorial Peals at Great Ryburgh. also that of the Society, Guild, or Association to which he belonged. have been helping with this research. brought the total number of names to 1133.
and on Robert Barker's page on the church website. 1st. so again this month you will hear ringing of a very high standard indeed. because we rang at Boston St Botolph's, otherwise known as “The Stump”. worth the view in spite of it being a little hazy. domed arch-work of the fan vaulting of the tower ceiling. and the ringing arrangements a little more user friendly! below, though not for the faint-hearted! 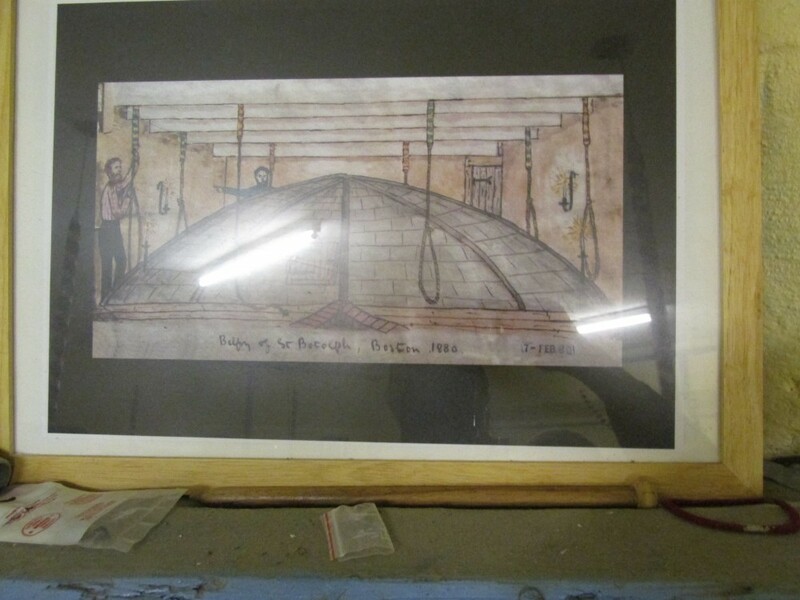 not captive ringers in a Lincolnshire dungeon! Frampton Marsh. A really good day out enjoyed by all 17 of us! July 1st. 1916 saw the start of the Battle of the Somme. It lasted until mid-November some 141 days later and claimed the lives over a million men. On the first day alone, 58,000 British troops were killed or wounded. A peal will be rung at St.Andrew’s for each of the men on the centenary of the day they died, as we have already done for the 7 servicemen who had died since the start of the War in 1914 I am very conscious that this is quite a lot of ringing in a short space of time but I trust it will not be the cause of too much aggravation in the village as a very small audible reminder of the carnage suffered and endured by so many. The half-muffled peals have been entrusted to a variety of visiting ringers (many eminent in the ringing fraternity) who have already set a very high standard of performance. The peals on 19th and 20th will be rung by the same band and conducted by David Brown who is assistant conductor at Westminster Abbey. 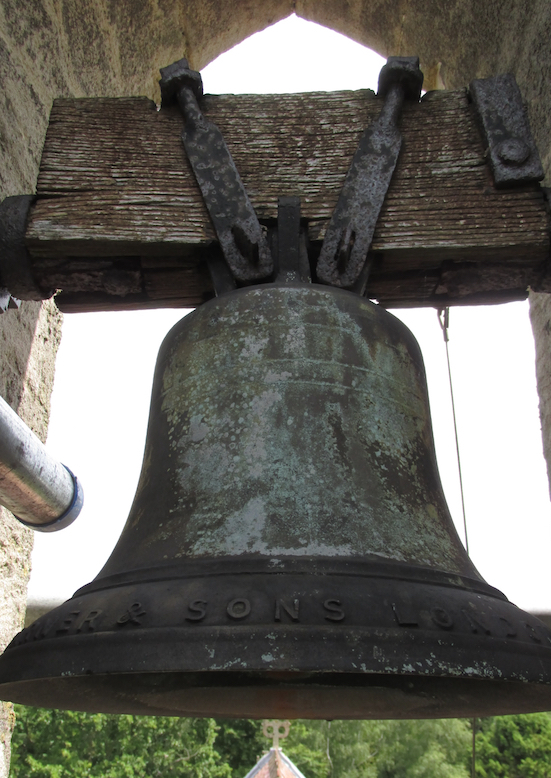 They will ring the 6 bells in the tower on the 19th but on the 20th they will ring a peal of Bristol Maximus on 12 handbells in St Thomas’ Chapel.This will be a very rare opportunity indeed to see and hear handbells being rung in public. Handbell ringing demands an enormous degree of concentration and we are very privileged that this band are to remember one of Ryburgh’s lost serviceman in this very special way. All are welcome to come and listen. 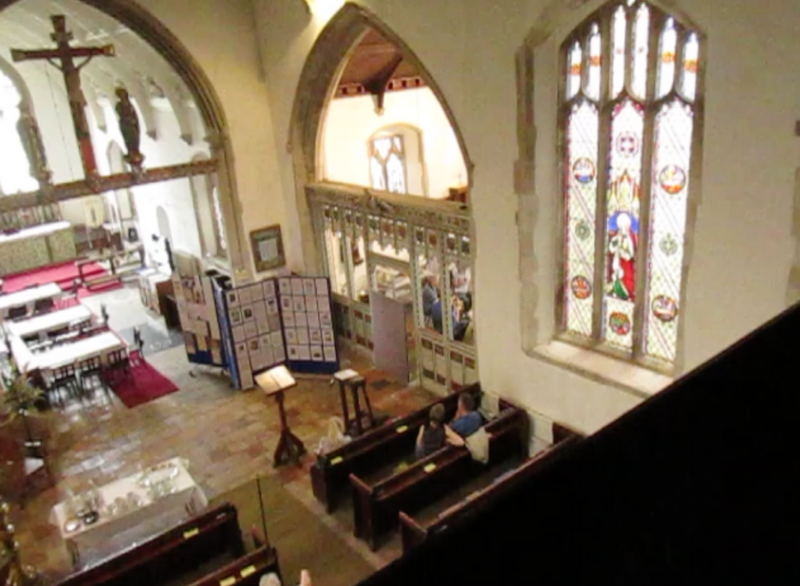 Although many men are being honoured with commemorative ringing throughout the country, Great Ryburgh would seem to be the only place where all the men connected with the village and who died are being so remembered throughout the period of the conflict. The extraordinary gathering of descendants generated by the remembrance of George Harry Bond and just as much, if not more so, the church devoid of any family for some of those we have already honoured, is the reason for all this happening. We must not forget. The band that rang the peal for George Harry Bond. The following is an article written in 2008 for the Ringing World by Neil Thomas and tells the story behind the set of handbells to be rung in the peal for William Ainger Howman: Neil with the beard and David Brown who will conduct the peal are in the photo above. After almost 100 years a set of handbells has come to light, a set of fantastic tone which belonged to a ringer, who in his time was one of the exercises “greats”. The following paragraphs are a little insight into the life and bells of Mr. Alfred W. Grimes 1880 – 1917. Blofield Garden Club is a long established society and indeed I was a member from 1978 until 1985. My mother still plays an active part and a chance conversation between her and another member, Mrs. Joy Foulger, led me to discover an extraordinary ringing story of a long forgotten ringing great. I was put in touch with Joy and so the story began to unfold. Joy was the only child of Ernest Grimes of Debenham, Suffolk. Ernest was an active ringer in Suffolk; he was secretary for the St Edmundsbury district of the Norwich Diocesan Association from 1919 until the formation of the Suffolk Guild in 1923. He died in 1937 and I guess this was when Joy inherited the ringing artefacts. 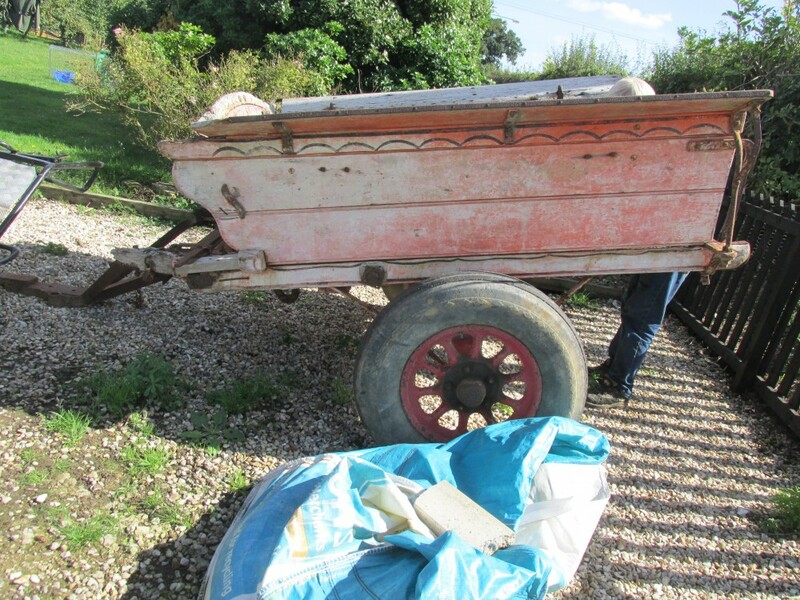 Joy’s husband had died and she was concerned, only having a grandson left, that if she died tomorrow the house would be cleared and most of the contents would end up in a skip. She was keen to see the ringing bits and pieces from her families illustrious past preserved. I was shown not only her father’s peal book, but also those of her grandfather, William Grimes, and William’s brother Alfred. All were prolific ringers of their time but it was Alfred who went on to great things. Following this I was shown a set of thirteen handbells, these bells I will return to after looking back at the life of Alfred Grimes. Alfred learnt to ring at Debenham and rang his first peal in 1896 at Thorndon. In 1909 he started ringing in London and around that time he took a pub, the George IV, Brunswick Street, Haggerston. Haggerston is situated about 1½ miles north of Whitechapel and ¾ mile north of Shoreditch in an area bounded by Kingsland Road to the west and Hackney Road to the south. Brunswick Street ran north from Hackney Road and became Haggerston Road just before it crossed the Regents canal. On this road stood the pub and also the church of St. Mary, a stunning building built to the design of John Nash in 1822-6. Sadly the street was largely destroyed in the 2nd World War. The site of the church is now a playground between Queensbridge Road and Thurtle Road. This is all I have been able to find out about the Alfred’s home. It was not until 1911 that peal ringing took off for Alfred and in 1912 he rang a total of 114. The following year he became the peal record holder, ringing 136 peals, the record of 127 formerly being held by James Washbrook . This made 250 peals in total in those two years! “Never was there a year in which so much ringing was done as in 1912, and it surpasses all previous records, to find some remarkable individual performances. To Mr. A.W. Grimes, mine host of George IV, at Haggeston, whose burly frame and genial countenance are so well known in the ringing circles in and around London, has fallen the opportunity of making the biggest “bag” of the year. Mr. Grimes rang no fewer than 114 peals between January 1st and December 31st – a truly prodigious number for one man to accomplish. They cover the whole gamut from Grandsire Triples to Stedman Cinques, and from Bob Major to London Surprise and Cambridge Royal, and a goodly proportion have been rung on handbells, while the tower bell peals were rung in 50 churches. In the issue of January 9th 1914 the same photograph appeared and again a near full page spread began thus. Alfred’s last peal was on February 15th 1916, Stedman Caters in hand with William Pye conducting. Sadly for Alfred, the burly landlord, his ringing career was cut short by influenza when he returned to Debenham, most likely to visit the family. 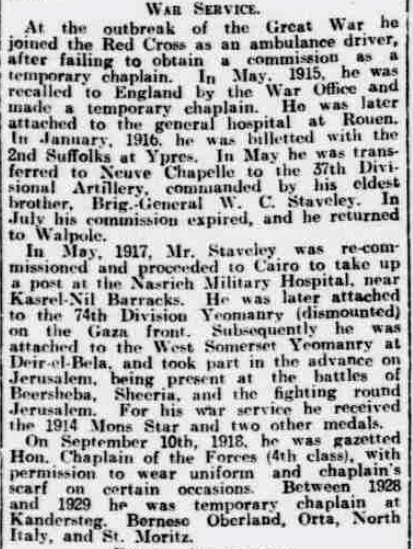 He remained there until he died on January 3rd 1917 aged only a mere 37. It was ironic as it was barely a year before the 1918-19 pandemic, which killed more people across the world than the whole of the First World War. Who can guess what further achievements Alfred would have aspired to had he lived? It can be seen from this story and his peal book that he bought a set of his own from the nearby Whitechapel Bell Foundry. These bells were regularly pealed in the pub. The first peal in the pub was in March 1912 of Stedman Triples. By November they rang Stedman Cinques. In March 1918 they rang the record length of Stedman Cinques in hand, being 6068 changes. I can’t be sure which peals were rung on these bells but having bought a set many surely were. 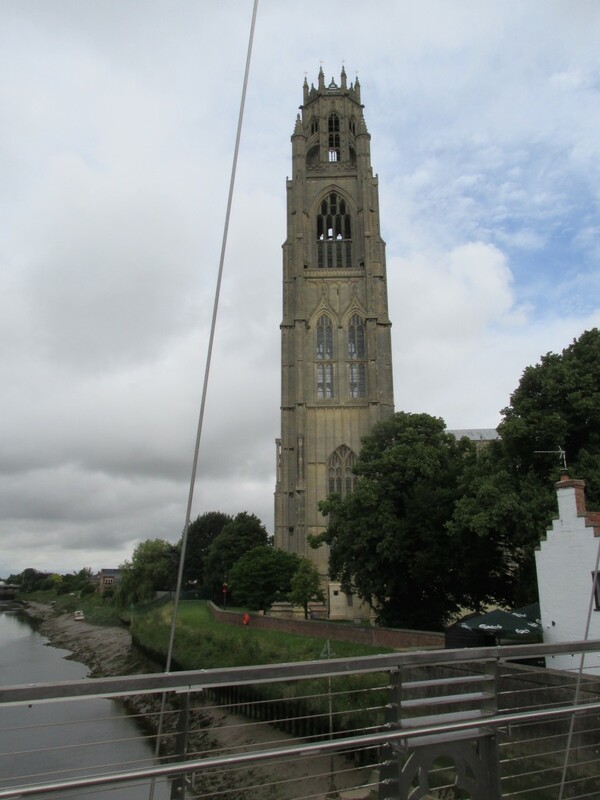 Many tower bells are linked to ringing history, for example those at St. Peter Mancroft, Norwich but rarely do you hear of handbells in the same light, so this set, I feel, are historically important. Having had these bells passed onto me I have taken them back to the foundry and their provenance holds up. 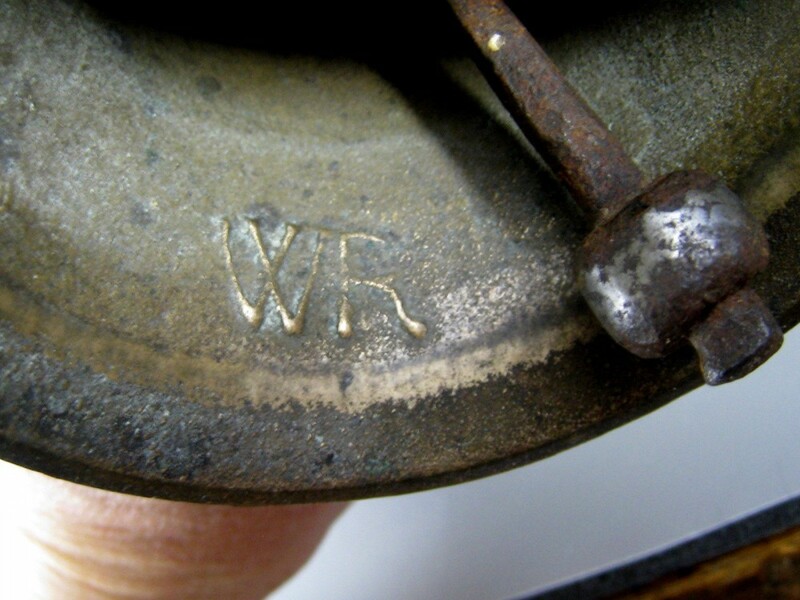 The tenor cap shows the mark of Bert Oliver who was the hand bell tuner during that period. The bells were sound but in need of total refurbishment and this I have undertaken. The bells came home for Christmas and the transformation is amazing! 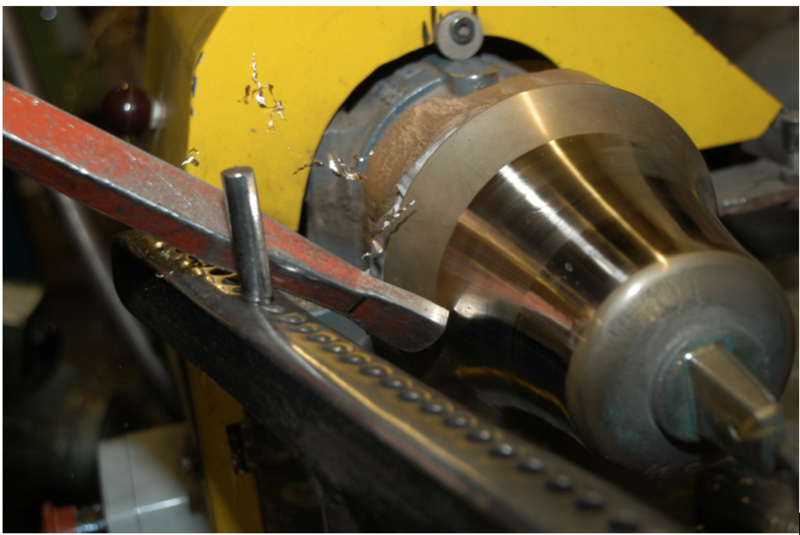 While they have been tuned to modern standards, Steve McEwen has left the tuning marks and imperfections from a hundred years ago and also the dints and marks of being used. This set of bells has a unique and complete history and having being hidden for sixty years have now come to light. Restored they sound fantastic. A huge thank you to Joy Foulger for bringing this important piece of ringing history to light and to Steve and the team at Whitechapel Bell Foundry for a great restoration. As you may have noticed, something new to the “Ryburgh Archive” turns up on a regular basis fortuitously providing me with copy and this month is just so. It started with a phone call from Paul Watson the son of former churchwarden Jack Watson of Winter’s Farm Gateley. Going through things, he found and polished up a trophy that had been presented annually from 1953 to the most successful bowler of the Boar’s bowls team and is inscribed with names right through to 1973. 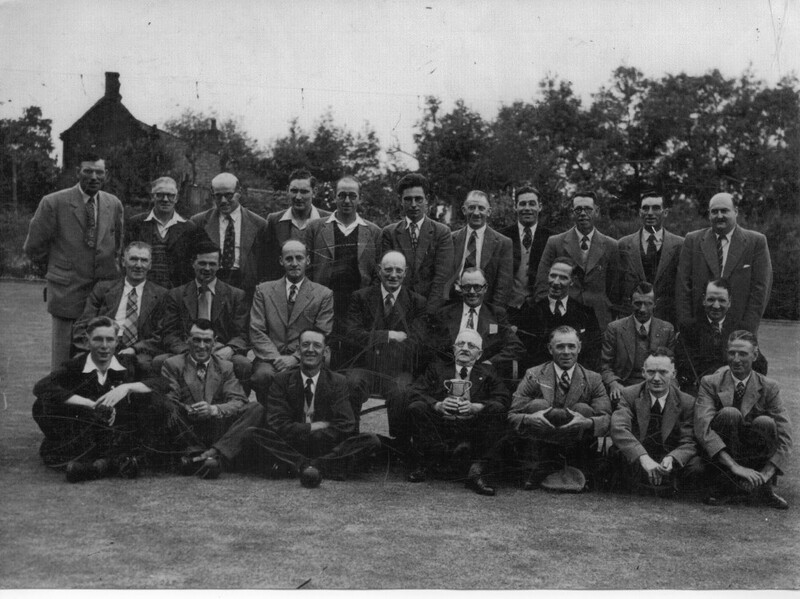 There is a photograph in circulation of the Boar’s bowlers showing the cup and many of the men named on the cup. Paul wanted it to come back to Ryburgh, and so it joins the football/school sports trophy that turned up last year on display in the church. George Bird, Stuart Neale, Denny Fuller, Ernie Scott, Stanley Tann, Cyril (Bonus) Rawling, Charlie Clarke, Ben Nunn, Jack (Jocky) Rawling, Alfred( Hoofy) Harris, Ben Riches. Fred Vertigan, Frank Howe, Ernest (Trinny) Nelson, Ted Baldwin (with cup), Arthur (Puddin) Vertigan, Hector Middleton and Billy Hall. We were able to exchange photos and he provided a new image of a presentation to the late Ryburgh Rector the Revd. Geoffrey Ford in which Jack Watson is making the presentation with Henning Boesen looking on. All in all a really nice glimpse of Ryburgh in the 1950’s so thank you very much Paul. 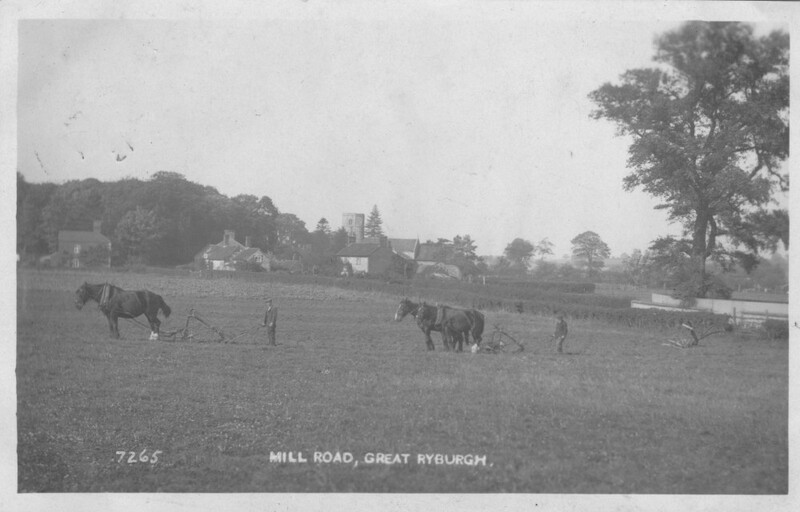 The other new image to turn up is a postcard view of Mill Road taken from the Railway line looking across the field to the wall of the Mill Farm and St Andrew’s beyond.It would seem that at this time, there was a length of wall on the West side of Mill Road opposite the Mill farm running parallel with the section that remains today. It was posted in 1916 and is really special as it depicts two teams ploughing and featuring men who might well have been in the trenches by the time it was posted. 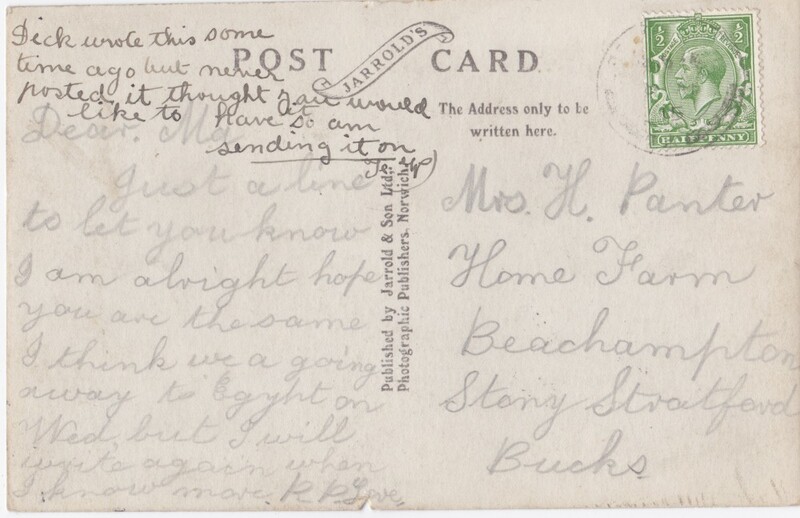 There is enough information on this card to be able to identify the sender, one Lieut. Albert William Hemington of the South Notts. Hussars, who was writing to his father who farmed at Spring Hill in Bulwell Nottinghamshire. He survived the War and died in March 1952. A little updating is also required this month to several past bell towers…….starting with a few words about the Farmers Foundry Tumbrill. 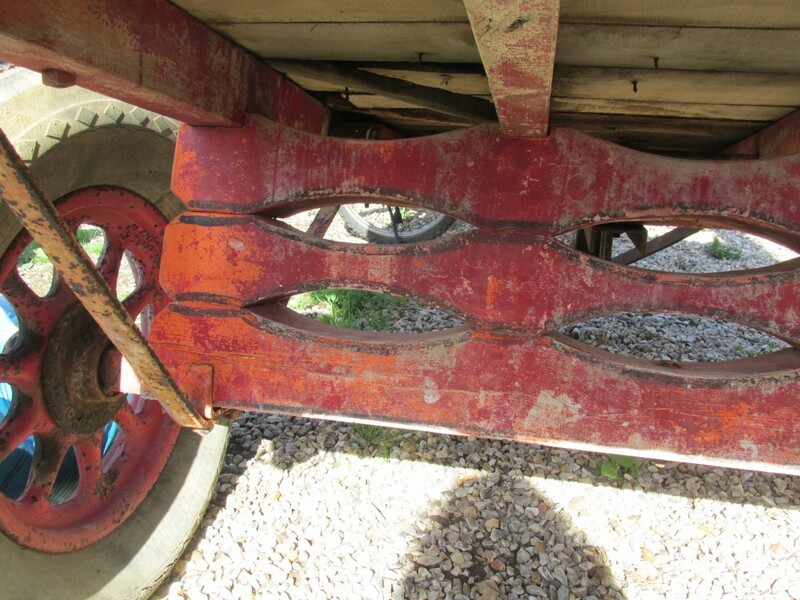 It is in the process of being completely rebuilt with all new timber and all the original ironwork except the nuts and bolts which had reacted typically with the old oak timbers. 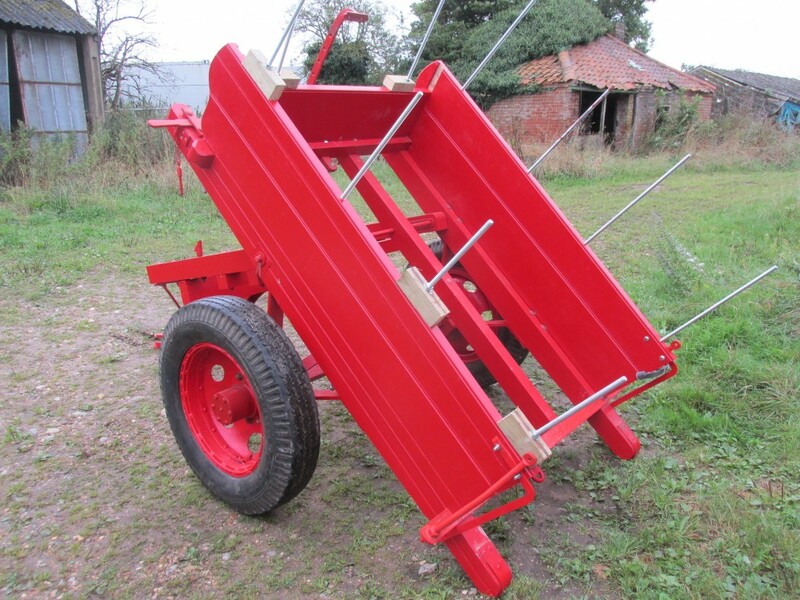 The cart bed and the whole tractor draw-bar arrangement has been reassembled, and the sides are now ready for drilling and fitting. The original wheels which where in poor shape have been repaired so that the replacement tyres can now be fitted, the wheels put back on and the whole thing made easier to manoeuvre. When these stages have been completed, we will be back to the state, though not the condition in which it was found. The next task will then be to reconstruct the missing portions.To be continued! The hand bells about which I wrote earlier in the year are still at Whitechapel undergoing refurbishment, however they will not feature in the peal for which they were intended because to avoid one of the six ringers (who are coming specially to ring the peal the previous day as well) “sitting on the bench” they are going to ring the peal on 12 rather than 10 handbells as a public performance in the church on the afternoon of July 20th. It will be absolutely not something you’ll hear every day of the week anywhere. The 12 bells are an historic set dating from 1912 and belonging to Norfolk’s Whitechapel bell hanger Neil Thomas, about which more next time. The internet has been buzzing with activity in regard to the George Harry Bond commemoration on June 5th. We are expecting the largest gathering to date of his family’s descendants to join us on the day, from home and abroad. To give some idea how this comes about, just one of his sister’s marriages produced 125 Great Grandchildren by the time those parents died and George had five other siblings! A very long time ago I wrote about the band from North Elmham who came to ring the first peal on the Ryburgh bells in November 1902.The following year that same band went to Foxley and rang the first peal on those bells after the 5th was recast and they were rehung. 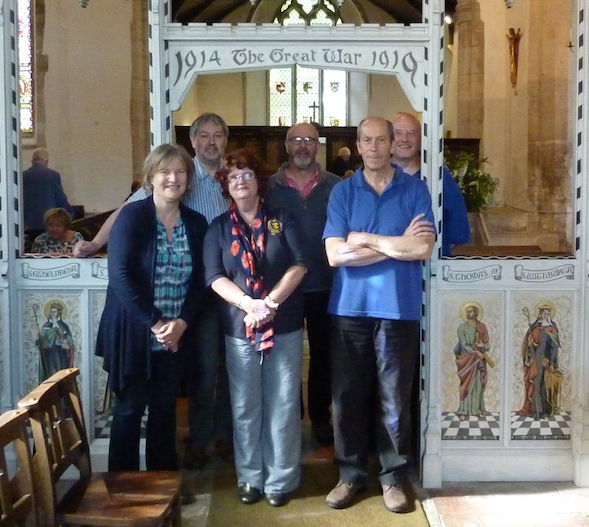 In the way these things come about, a band of ringers who have been ringing in the WW1 peals here at Ryburgh had the distinct pleasure of ringing the first peal at Foxley since the recent rehanging of the bells. This was also the first since the early 1950’s when they were last rung to a peal and Jack Watson presented the trophy to those bowlers from the Boar. 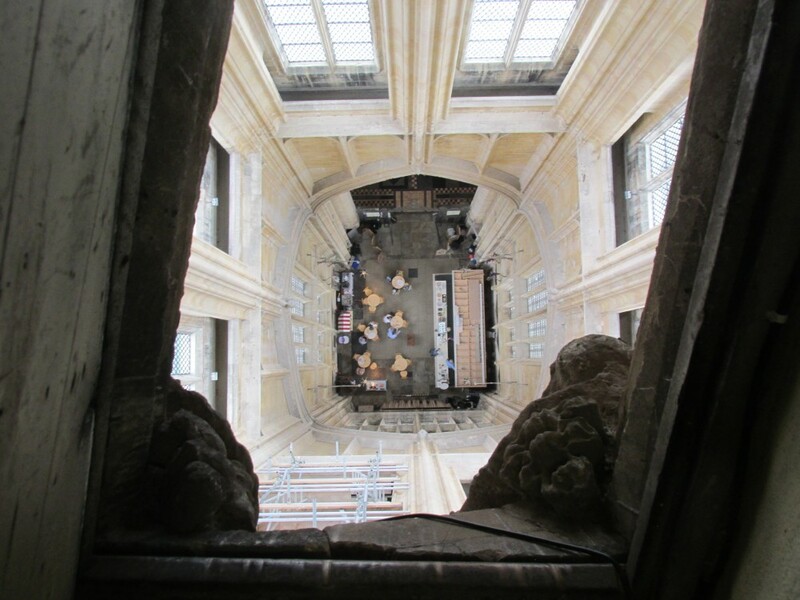 On the Comper Organ Gallery, the panels of the balustrade have been hung with a facsimile type of Think and Thank Screen Panel to bring into the church some of the names of those that died and who were not included here at the time on the Screen itself. This is the reason for a panel marking the death at sea of George Harry Bond who was born in Redenhall on June 26th 1881. He died on June 5th 1916 whilst serving on board H.M.S. Hampshire. The sinking of this ship was a national disaster at the time (though played down for obvious reasons) because it claimed the life of the illustrious British Commander-in-Chief, Lord Kitchener. The Ryburgh School Log Book records this particular event but sadly makes no mention at any time during WW1 of any village casualties. In this case it is possible that it was not even known at the time that Ship’s Corporal George Harry Bond was on board. His name is inscribed on the village obelisk in Station Road under 1916. 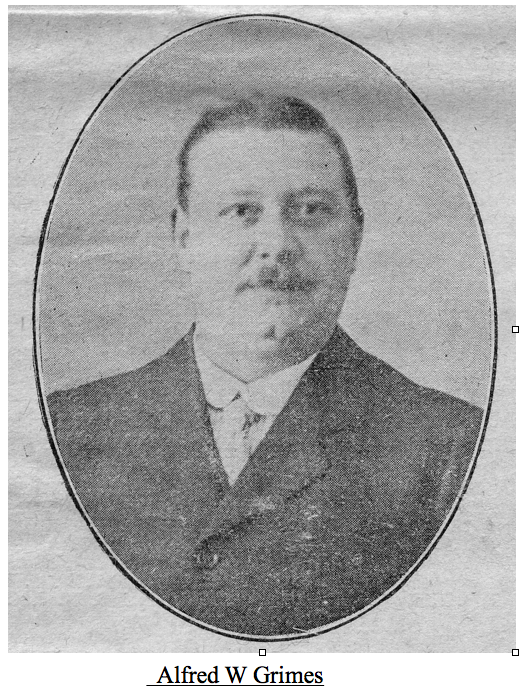 His family moved from Redenhall to Ryburgh probably in 1893 when Harry Bond Snr. a stationary engine driver, started work at F an G Smith’s newly modernised flour mill in charge of the Mill’s power plant. Young George Harry Bond may have completed his last two years at Ryburgh school, but unfortunately the Registers don’t go back that far to confirm this. Having been in touch with descendants over the past few months, a picture of George Harry and his extended family has been assembled and can be seen both in the church and on the St.Andrew’s webpages. A commemorative centenary peal attempt will be undertaken on Sunday afternoon June 5th this year, the first of eight dates during the coming year to be so marked and we hope to welcome several of George Harry Bond’s descendants both local and from Australia to join us at St Andrew’s during the day. “She certainly remembered that she lived next door to the Sumpter's and that her brother William received his call up papers and went off to war when she was about 10 years old. She clearly remembered him walking off with her brother and Cecil Sumpter, but she didn't know his regiment or ID no I'm afraid. He was badly wounded and was sent initially back to Scotland. Her mother 'Polly' was very relieved when he finally came back nearer to the family home as she couldn't visit him there with so many in the family to look after. Her brother never really recovered, spending the next 5 years in and out of hospital until his death. She believes he did have some medals but his death was a blow to the family and war service not much talked about. 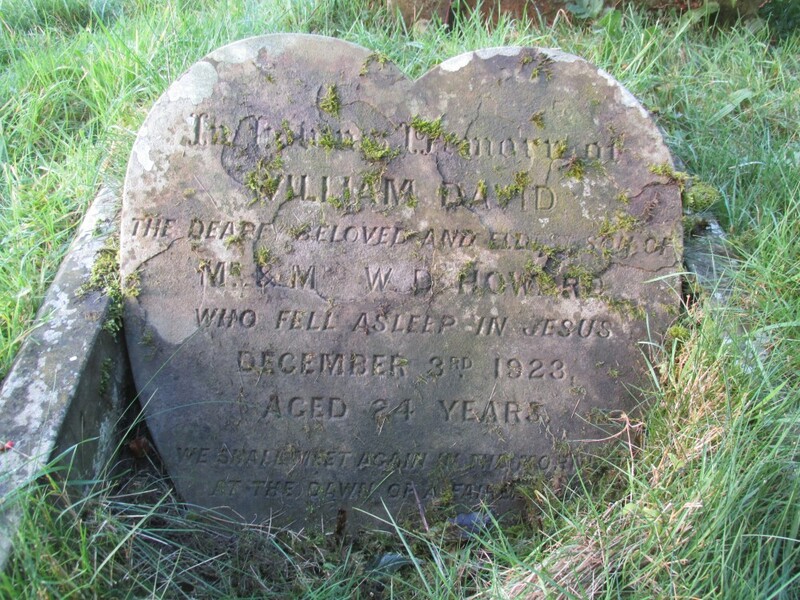 It was a great regret to me not to have had the chance to meet but I have been able to find a little more about William Howard and also that he is not remembered on the War Memorials at Kettlestone (technically the parish of which Langor Bridge was a part) Fakenham (to where the family moved). Langor Bridge looked to Ryburgh for its school and church and William Howard’s father was Sunday School Superintendent at the Primitive Methodist Chapel at Little Ryburgh. Consequently, William will be remembered at St Andrew’s since he clearly died of wounds suffered in the service of his country, albeit in 1923. How many more have been forgotten in this way? Cecil lived at Langor Bridge next door to William David Howard, served in and survived WW1, but not named on the Roll of Honour at St Andrew's. As the proposal to restore the former church Acetylene Gas House and to build new toilet and storage facilities gets under way, it seems a good opportunity to report something of the history of this tiny building that “piggybacks” on the churchyard wall. The Gas House was built in 1914 on top of a section of the South facing churchyard wall as a place to generate the Acetylene gas required to light the church following the Comper restoration of 1910-14. 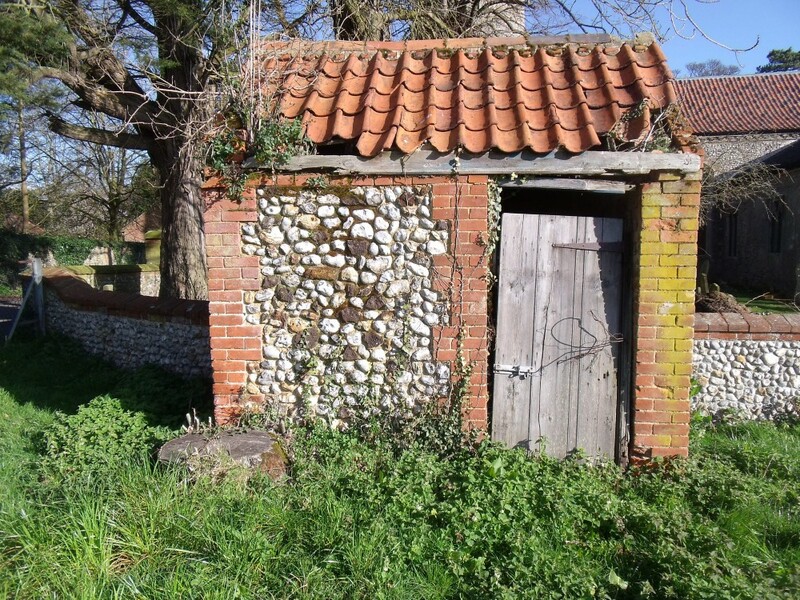 It is very much a functional brick and flint outbuilding but essential for the then relatively modern lighting system that was planned. The choice of lighting fittings had been the subject of some correspondence between the then Rector, Revd. F.H.Tatham and John Ninian Comper and can be read in full on the church website pages. The Question of the church lighting was brought up, and the Rector showed that he had already in hand £14 7s.9d. and promises amounting to £11 10s.0d. It was decided that the best plan would be to have a separate generator belonging to the church to supply the acetylene gas rather than to have it supplied from the (existing) rectory generator. This would entail further outlay, but it was generally felt would be a better plan in every way. The cost of fitting pipes, supplying brackets, &c. in the church would amount to about £30, and the generator and house for it would probably amount to a further £35. 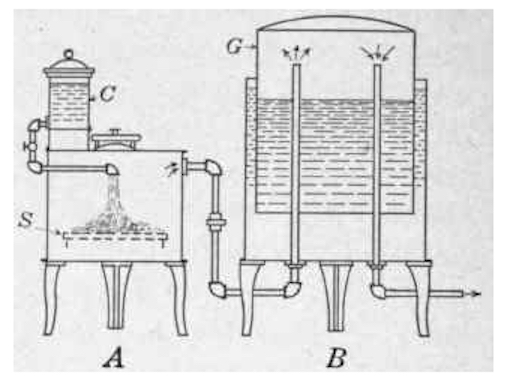 The type of plant that the Gas House would have contained. Owing to the great generosity of Mrs. T.A.Cook we are able after all to to have the Acetylene Gas installed in the Church this Winter. I had quite given up all hope of having it under the present circumstances. The Firm who are supplying the installation hope to have it all fixed and in going order by Christmas Day. Mrs. T.A.Cook's most kind gift which has enabled us to have it was a cheque for £30. The February 1915 Magazine reported how all were delighted with the new light but that owing to the rising cost of materials due to the War, the firm that carried out the work were likely to be out of pocket. The generating plant also supplied lighting for the Rectory Barn opposite and remained in use until the church installed electricity in 1948, due to the prohibitive costs of running the system. (Carbide had risen in price from 10/- a drum in 1915 to £3 by 1948.) Following its closure, it was used as a small store for a variety of items including waste paper, cans and bottles for recycling. The building has now reached a parlous state due particularly to a large Ash tree, now felled, that was allowed to grow on the SW corner. 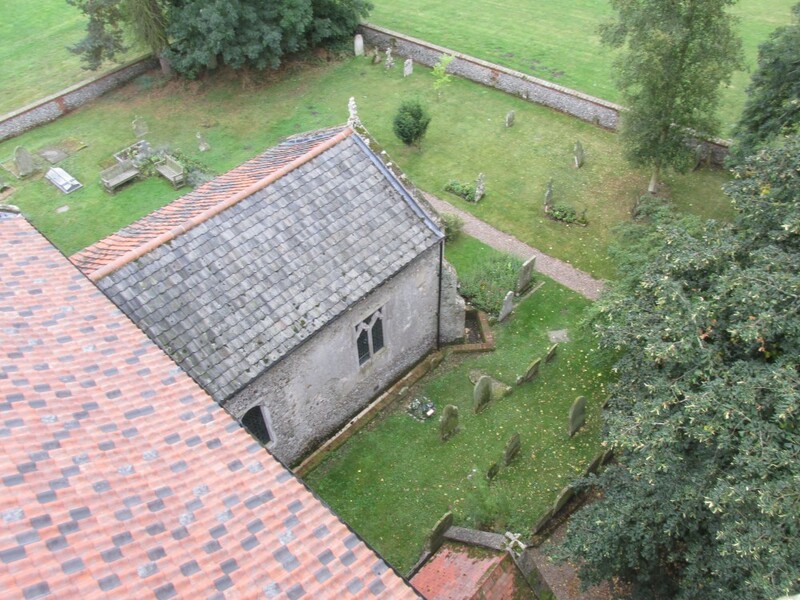 As part of the proposal this little building will be restored and used as a store for the churchyard’s use. P.S. 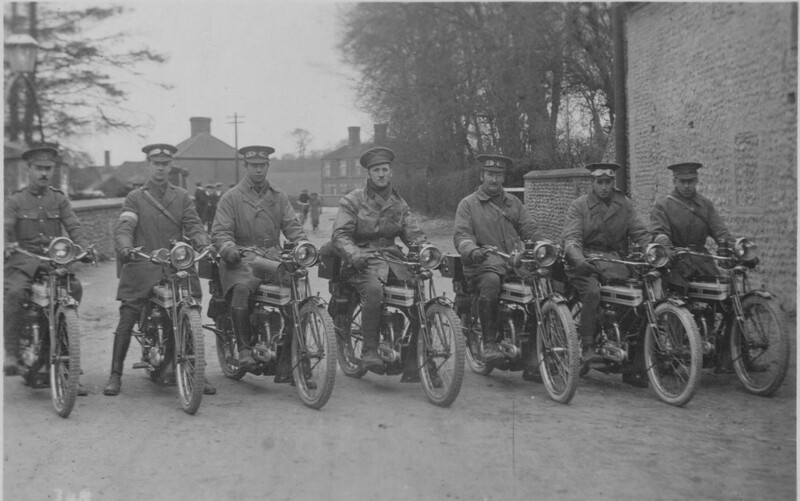 I have written in the past of a group of motorcyclists photographed across Mill Road at the Church corner. 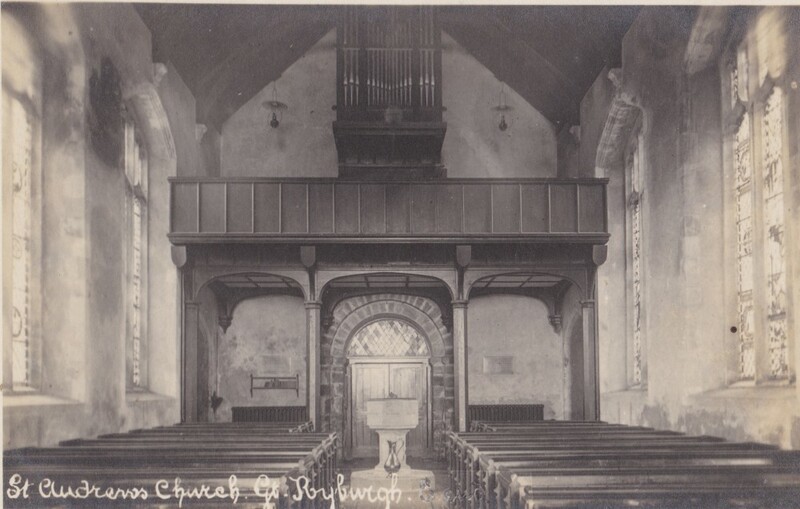 I speculated at the time that the photograph might date from 1916 because of a report in the Parish Magazine that a group of motorcyclists visited the church in June that year. However, the angle of the image is such that the new Gas House would have been clearly in the background if that was the correct date. So as far as that photograph is concerned, we need to think again….. at least two years earlier! 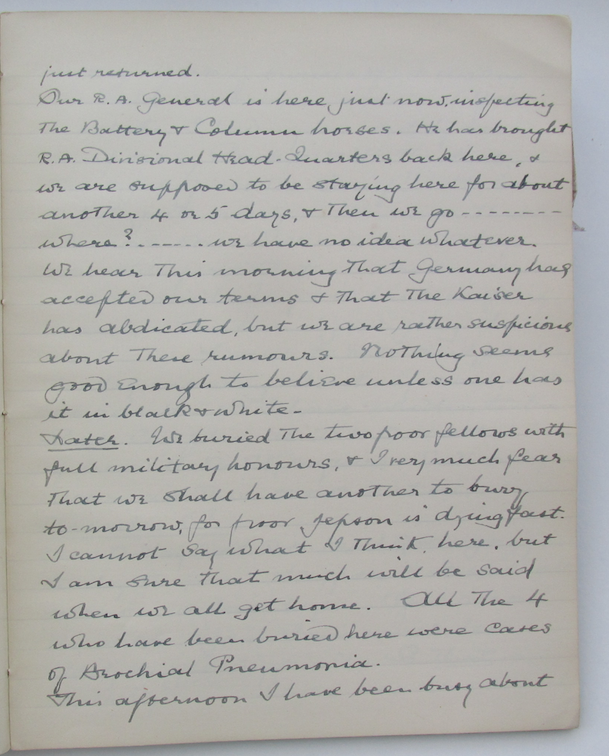 Could this date from the time of the billeting of the Bucks Hussars in Ryburgh in November 1914? In July 1915 according to the Parish Magazine, “some of the stone work at the top of the Tower gave way and fell on the roof of the heating chamber” necessitating urgent repairs as “the stonework was in a very precarious condition”. 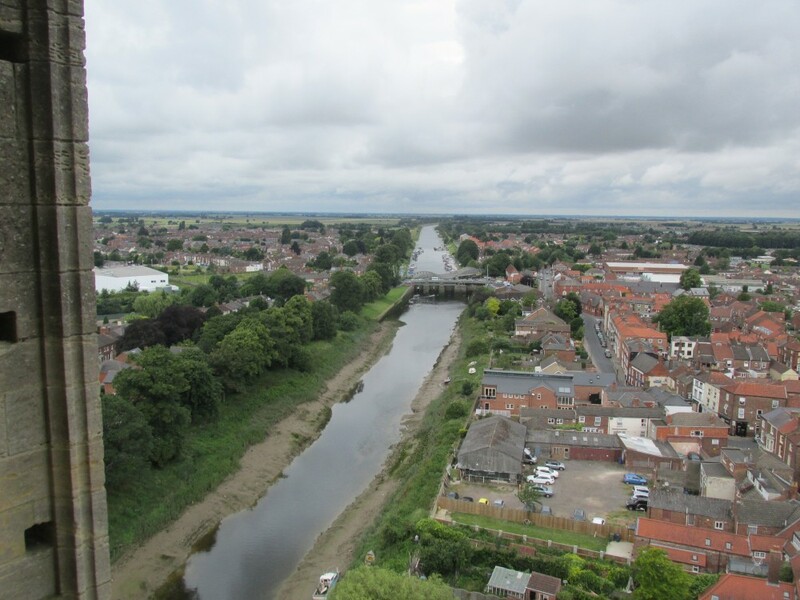 I recalled this when being asked recently to read through a draft of an article by Norfolk ringer John Barnes about the eight Norfolk Towers which had collapsed since 1895. 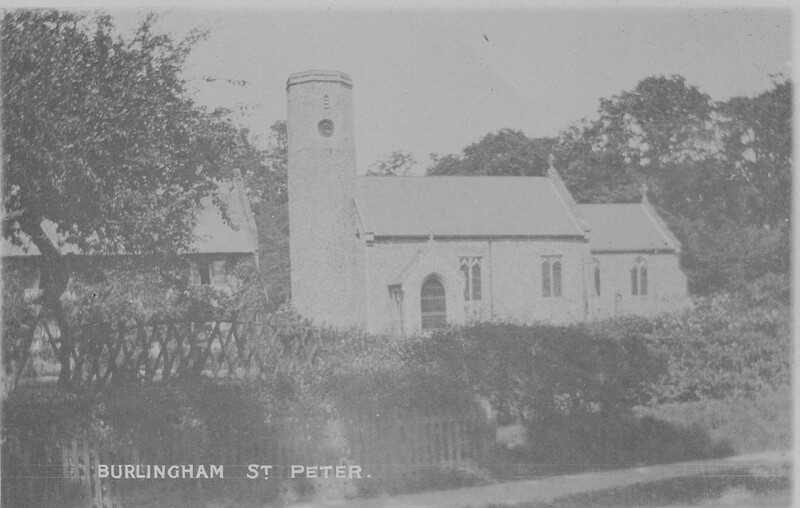 I also remembered a couple of postcards that Hazel Hall had lent to me of one of those towers, St Peter North Burlingham. 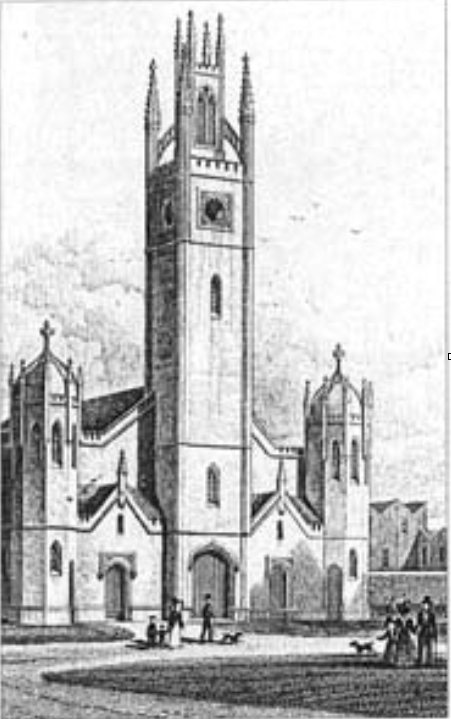 They show the church before and after the collapse in 1906, with the latter being so soon after the event, one of the bells can be clearly seen protruding from the rubble. 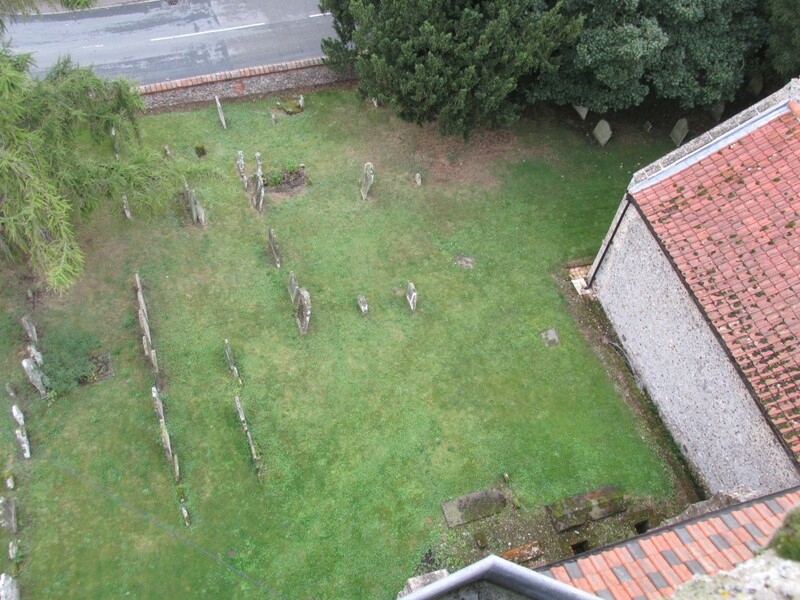 The bells all survived their ignominious descent from the belfry and now ring at St Martin, New Buckenham, after being first housed when the church closed, at the old St Peter Hungate Museum. As ringing was surely suspended at Ryburgh in consequence of this structural problem, then I thought I would take the opportunity to digress into other matters of the War years, as is my wont! The Revd. 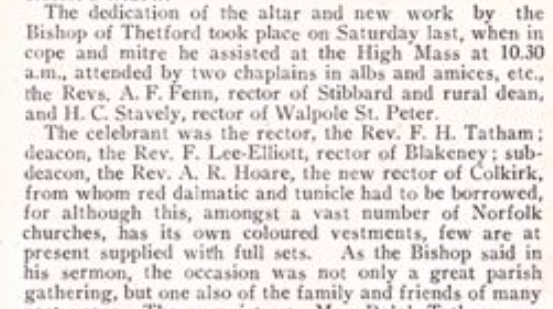 F.H.Tatham tells us, again in the Parish Magazine that he had to take services at Stibbard because the incumbent and Rural Dean, the Revd. 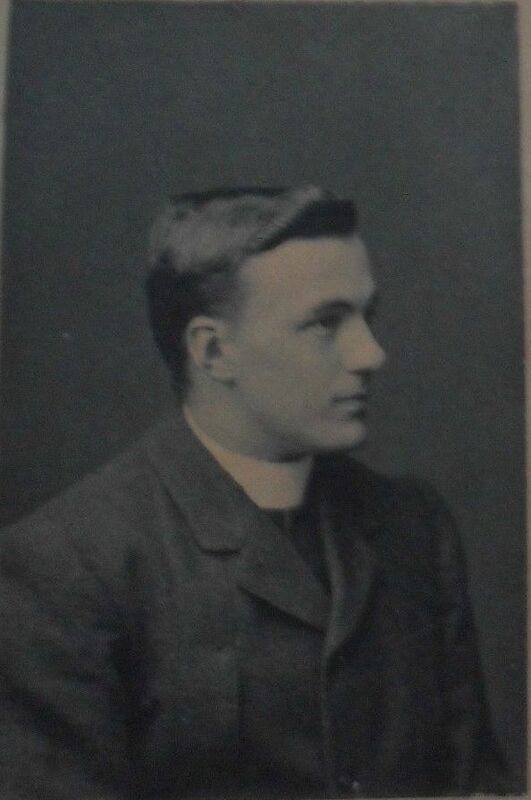 Anthony Fourdrinier Fenn had joined up as an Army Chaplain in 1916. This set me thinking about the contribution made to the War by such clergymen and why perhaps Ryburgh should remember them as well as all the names on the Roll of Honour at this time. If anyone reading this knows of a photograph of Revd. A.F.Fenn, please get in touch. It is fortunate that Hugh Tatham did not have to cover for Colkirk too, as their Rector, the Revd. 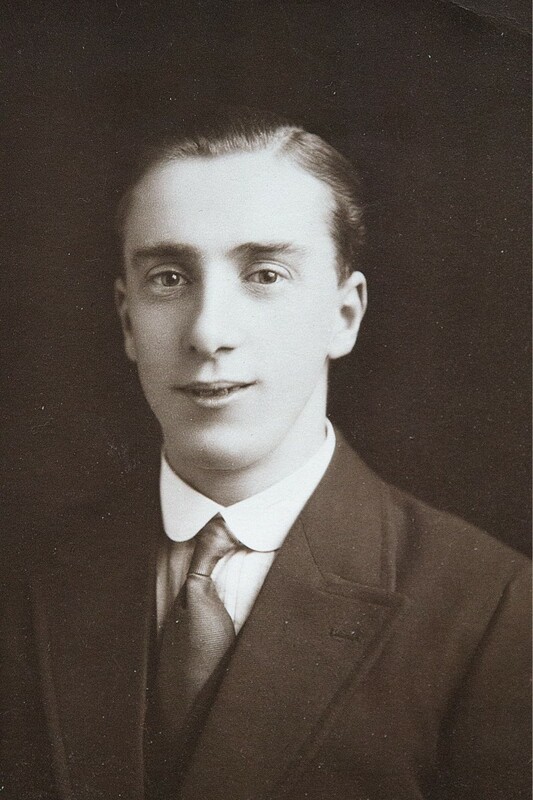 Arthur Robertson Hoare, who succeeded his father Walter as incumbent, also served as an Army Chaplain from 1916 to 1919. 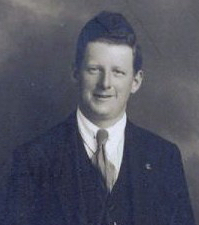 Arthur had been born at Stibbard and both he and Anthony Fenn were also “Mentioned in Dispatches”. 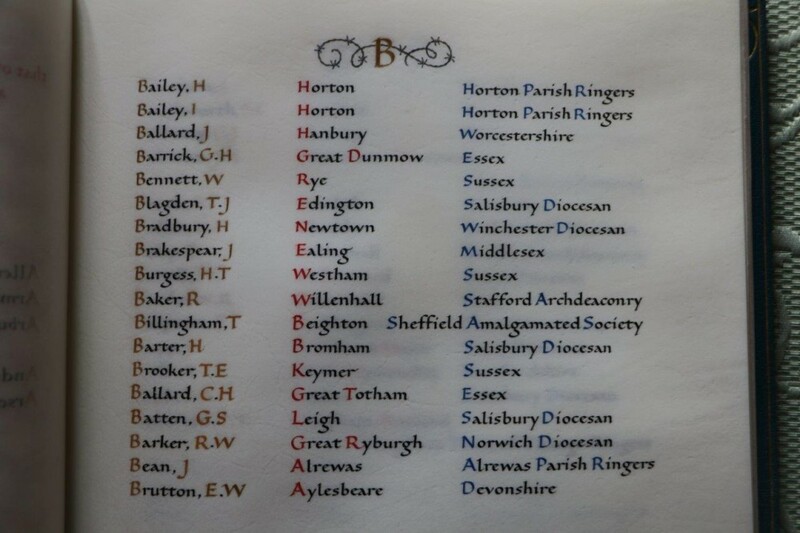 These names were all familiar to me individually but they were all known to each other and surely not just because they all took part in the Service of Dedication on Nov 30th 1912 of the Comper Restoration works. Unfortunately I can not find out if they all met again in similar roles when the Think and Thank Screen was dedicated in November 1921. 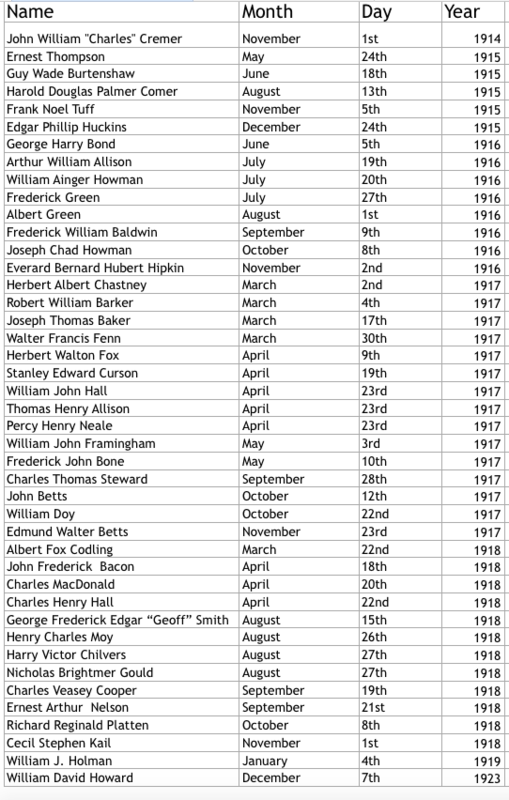 As I research these 3 local gentlemen further their stories will be added to the website pages. 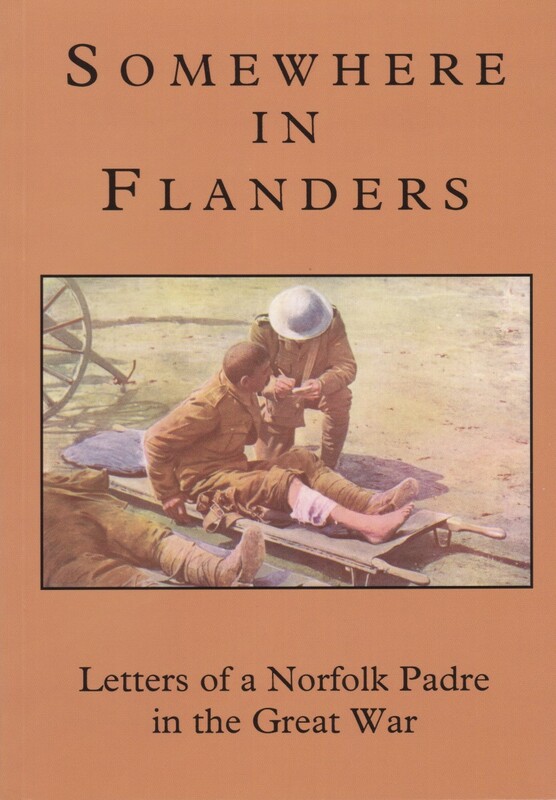 If you haven’t come across "Somewhere in Flanders", the collected letters of Army Chaplain “Heigham Woodbine Willie” a.k.a. the Revd Samuel Frederick Leighton Green, then they are worth seeking out These are edited by Stuart John MacLaren, published by the Larks Press and make a fascinating history of a serving non-combatant. PPS Don’t forget we ring twice a week Tuesdays and Thursdays from 7.30p.m. and as far as I know we are not expecting any tower collapses in the near future! Towards the end of last year we had a visitor to our practice, an Englishman who now lives in Canada. As we were sitting around the table drinking teas and coffees after ringing he said “Did anybody want a set of handbells” Needless to say, I “registered an interest”. He said that he had rescued them from a house clearance because he didn't want them ending up at a dealer who would probably split up the set. 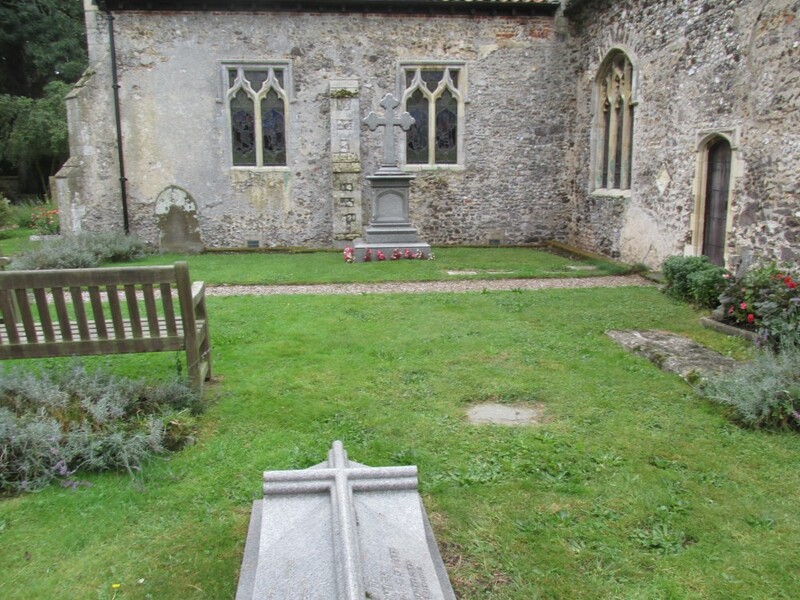 They had belonged to a couple who last rang at Aylsham and they had now both died. He didn't want anything for them and they were in the back of his car. So I went with him to the boot, with as much decorum as I could muster whilst in the process of snatching off his hand, and took them into safe custody! There were ten of them but they were not in the first flush of youth, in fact they were supposed to date from the C18th Century. The first task was to get an opinion locally which confirmed that they needed attention before they could be rung successfully. The next stage involved sending them to the Whitechapel Bell Foundry to have them properly appraised. They were refurbished about 100 years ago by the Warner foundry (The same firm that cast the Ryburgh School bell and the bell that hangs in the bellcote at Horningtoft) and who also probably attempted to tune them at that time, removing in the process, most of the original filed tuning marks. The bottom line of their comprehensive report is that to refurbish them fully to an “as new” condition (although without altering their historic pitch which is different to the modern standard) would cost nearly £1,900.00. This is quite a lot of money…. however this is only about half the cost of buying an equivalent sized new set! 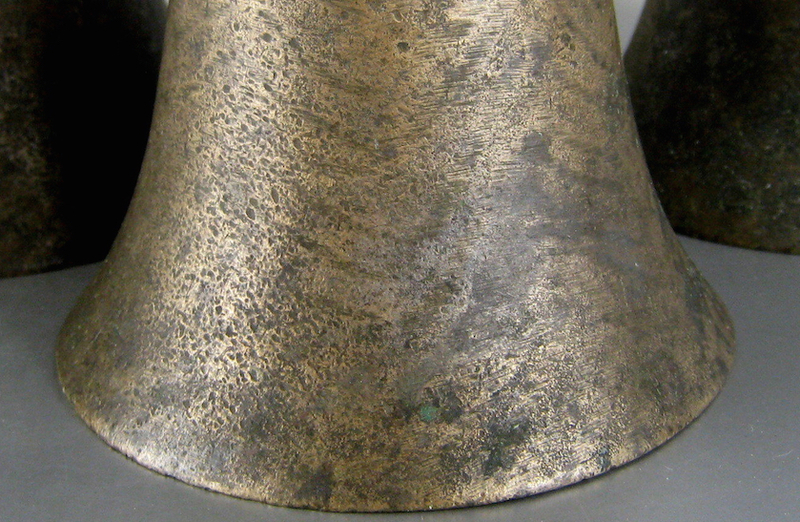 These bells were not necessarily originally intended as a tune playing set, but these have been long used for ringing changes two in hand (i.e. the complete set is rung by just five ringers) which is a very special skill that not many ringers manage to perfect. My first thought was that they could be a set for the tower, followed by my second thought that it was not really something that limited tower funds could finance. 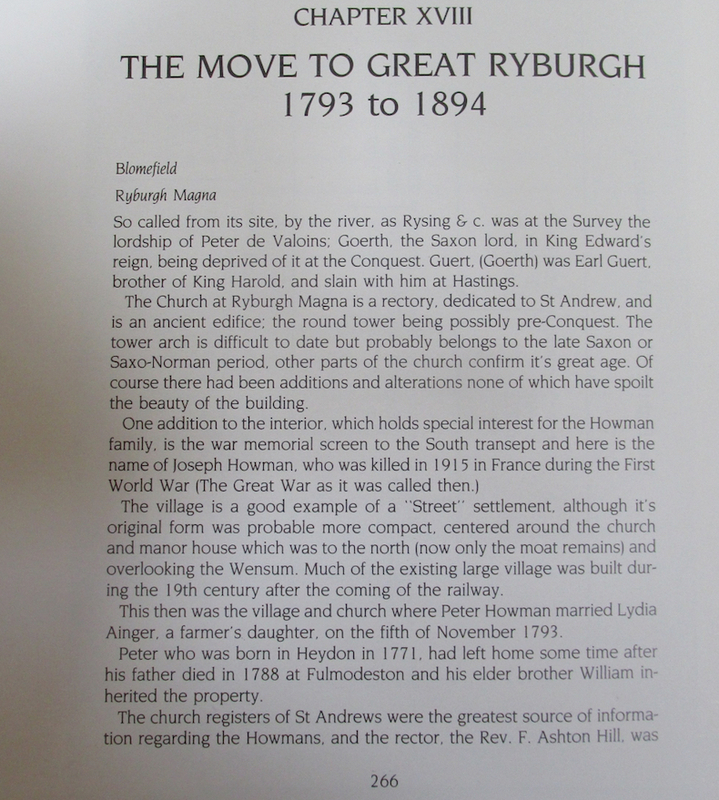 I also recalled that there had once been a set in Ryburgh which had over the course of time disappeared. The probable reason for that being there was not the expertise to ensure their regular or continued use after the first flush of interest. 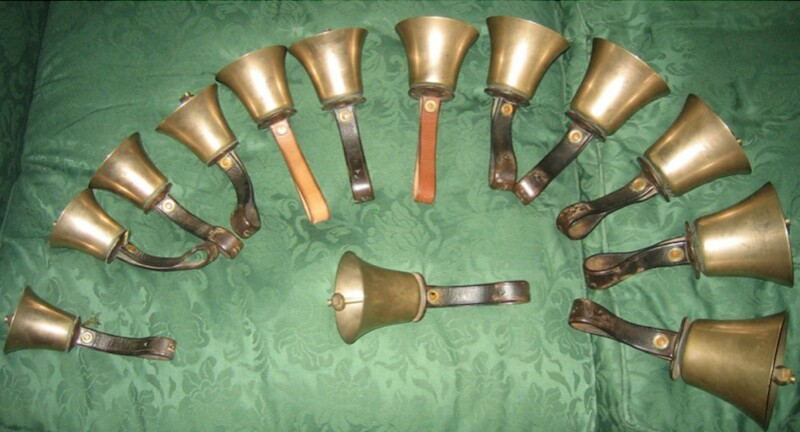 They were then lent/borrowed for some simple tune ringing, found to be inadequate for the purpose and are no longer to be found There are also many sets of handbells languishing in damp boxes in towers throughout the county and I didn't want these to suffer the same fate. In common with all musical instruments, they need to be played regularly or they deteriorate quickly, and these have something of a head start. They are also important enough to warrant keeping that deterioration at bay and so with that gift comes a duty of care. 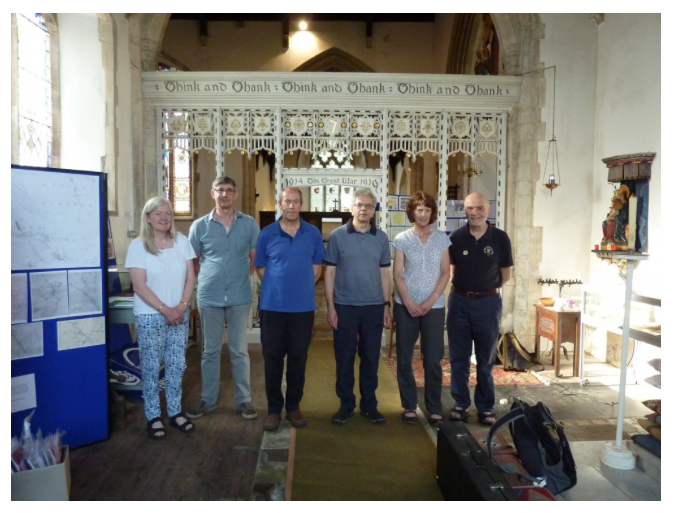 David Brown, who conducted some of the commemorative peals last year, was keen to be involved in our future peals and he was available for the two peals on consecutive days in July when we remember two of our past villagers. To have two 3 hour peals so close together could possibly be viewed as pushing the boundaries of the goodwill of those in the immediate vicinity, however much it might draw attention to the reality of another lost life. Rather than ring one of the peals elsewhere, I then thought that if one of those peals were to be on handbells, then both the soldiers would have been duly remembered at Ryburgh. David was very keen to do this as he regularly rings handbell peals with a very elite group of ringers. They were also very happy, in spite of the fact that this form of change ringing requires huge amounts of concentration, to have this as a public performance. 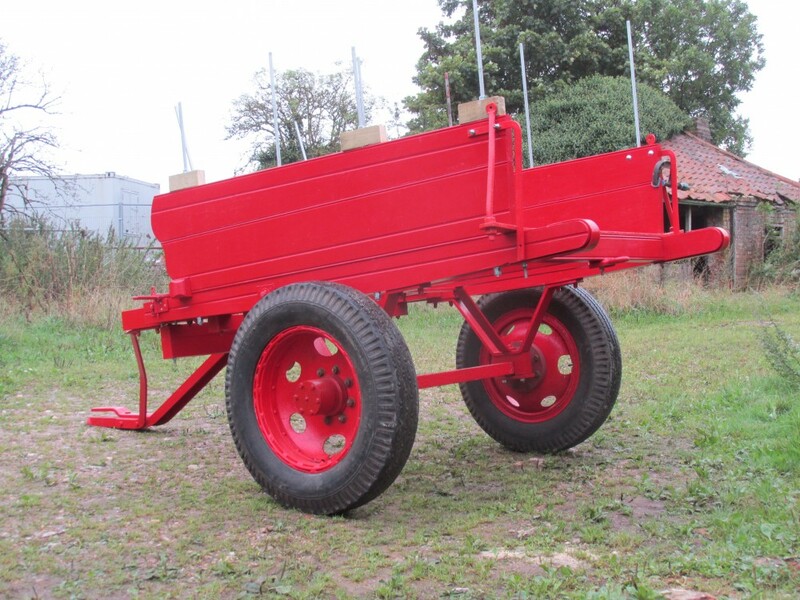 This has been the catalyst for having the first of a possible three stage refurbishment carried out to the ten bells which will now make their first Ryburgh appearance at midday on Wednesday July 20th this year as we remember William Ainger Howman. Although there were no conditions attached to the gift I did say to our Canadian friend that if we could not put them to good use here, then I would pass them on to someone else who would appreciate and use them for their intended purpose. I am very pleased to say that we have made a good and very fitting start. There will plenty of notice about this peal nearer the time and if you have never heard the mesmerising music of change ringing on handbells, I would say this is a very definite must for your diary and an experience that you will not quickly forget. The Warner Bell at Horningtoft before re-hanging.